Great Innovations has created a brand new version of the Engineering Slide Chart. 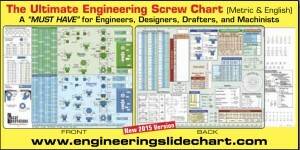 The Engineering Slide Chart is a tool for engineers, designers, drafters, and machinists. It includes technical information from many of the quick references that are commonly found in the work areas of mechanical designers, machinists, and CAD users. All of this information is compiled for both English (Imperial) and Metric systems in a single screw chart. The Engineering Slide Chart is available in a durable plastic version and as a phone and tablet App. Great Innovations' screw chart serves engineers and machinists throughout their careers and is rapidly becoming a helpful time saving industry standard.